Successfully Added Thrifty - Car Cigarette Lighter USB Charger to your Shopping Cart. This ultra compact thrifty car accessory is designed to simply charge any of your electronics devices, be it a cellphone, a car GPS navigator, a portable media player, even your iPad and iPhone 4. The thrifty car cigarette lighter USB charger is all you need to turn your cars cigarette socket into a USB port! When you insert this USB charger gadget, you'll notice how space saving it is - it only sticks out from your lighter socket by 10 mm!, while providing you the added convenience of permanently having a USB port in your vehicle for charging all sorts of electronics devices. 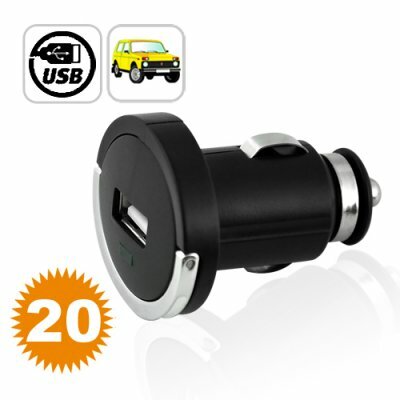 This USB car charger gadget also come with an LED indicator that lights up to let you know that your mobile phone, GPS Navigator or any electronics device you happen to be charging is being charged. And because of its raised height of only 10mm when inserted, it comes with built with a lever that helps you detach it without having to apply any force. This car gadget is brought to you by the leaders in wholesale consumer cheap electronics - Chinavasion. Display this product on your eBay listing or drop ship website and start making some profit today! Yes, this USB car accessory will work with any car with a lighter socket. An excellent product, that is at a very good price and has proved to be extremely popular!! These are nice and tidy units. Quality is good and because they are small, they fit nice and discreetly into the cigarette lighter fitting.